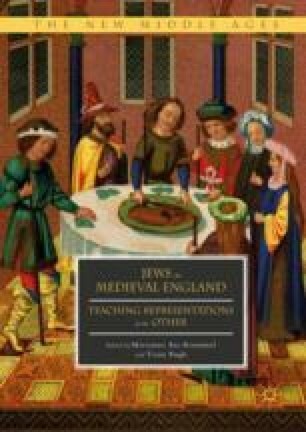 Historical evidence suggests that Jews did not arrive in England until circa 1071, so most pedagogical discussions about Jews in early English society focus on texts produced by Anglo-Saxon Christians. The Jew was utilized by these authors both as a valorized, pious exemplar and as a demonized, elemental devil. To reconcile this contradiction in the college classroom, instructors must develop their students’ knowledge of the Anglo-Saxon period in conjunction with the ideation of Jewish alterity within it. Anglo-Saxon texts in translation—namely, Judith, Daniel, Exodus, Genesis A and B, and Elene—can be used to shape students’ foundational understanding of the Anglo-Saxon world and the Jews who inhabit its literary imagination.